Regarding our recent stay at Lakeside Majesty. 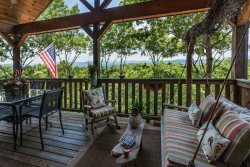 We've been renting cabins in Upstate SC and north Georgia for many years. This is as nice a place as we've ever rented. However; the way the property presents is exceptional. Upon arrival, there was soft music playing, a gentle air freshener greeted us. The little details like the towels being rolled up, bathrobes, the upscale dinnerware carefully placed in the drawers. The Keurig coffee maker, plenty of firewood, soaps, laundry detergent spices, etc. Everything was immaculate. Four large screen tv's with premium channels. Excellent internet connectivity. All light switches were clearly marked. The landscaping outside and the zoysia sod was great. We had an exceptional stay. Thanks again. VERY NICE QUAINT CABIN Very peaceful weekend. Clean hot tub. Beautiful area right next to the river. Perfect Memorial Day Weekend Getaway! This was absolutely perfect! The cabin is very clean and the king bed and pillows were so comfortable, I didnt even use my own pillow that I brought. The kitchen had everything we needed to cook out own meals. The grill was a bit slow and took a really long time to cook hot dogs, but we werent in a hurry, so we didnt mind. The next night, we just planned ahead for the kabobs to take longer. No big deal! Our dog loved the cold creek right behind the house and my husband and I loved listening to the storms on the porch at night. There are neighbors close by, but everyone was nice and kept to their respected spaces. It would also be a fun weekend to rent 2 of the houses out there for a large group of friends and/or family. We rode our mountain bikes around the area by the house and quickly realized how out of shape we are and decided to hike a trail, rather than bike it. Ha! Bear Creek Trail is super close to the cabin and definitely worth the trip to see the giant Gennett Poplar tree! An easy hike, well mapped trail, and a few streams to cross. It was only 1 mile in to see the tree, and you can go further if you want. Also made a trip into downtown Ellijay one day. There are tons of cute shops and restaurants, so worth the 10+ minute drive back into town to check it out. Overall, this was probably one of the best weekend trips my husband and I have taken and will definitely be back. I might even pick this place over the beach!! Amazing!!! Wonderful cabin! Perfect size for me and the boys! This is our second trip to Blue Ridge and we love it! Looking forward to coming back next year!